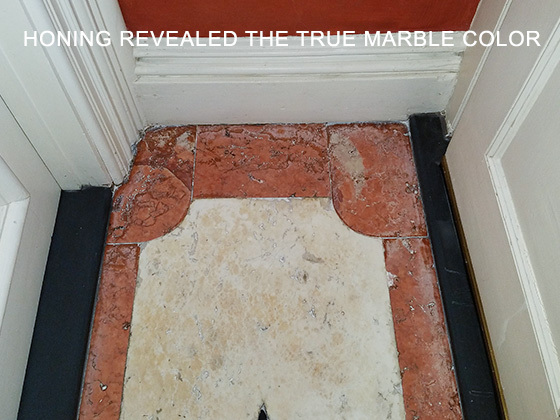 This image was taken when we first arrived on the job, before any marble refinishing had taken place. Here is the rest of the damaged marble floor. This image was taken during our marble restoration process, after honing, but before any dyeing or polishing. Here is the restored marble floor. Beautiful! 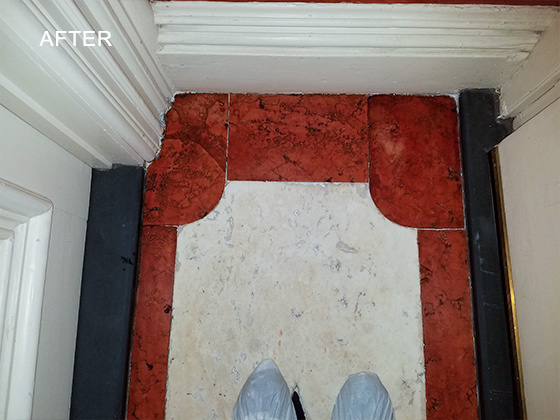 The border appeared to be a typical red marble, but once we started honing away the damage, we discovered the border was actually a white marble that had been painted or dyed. 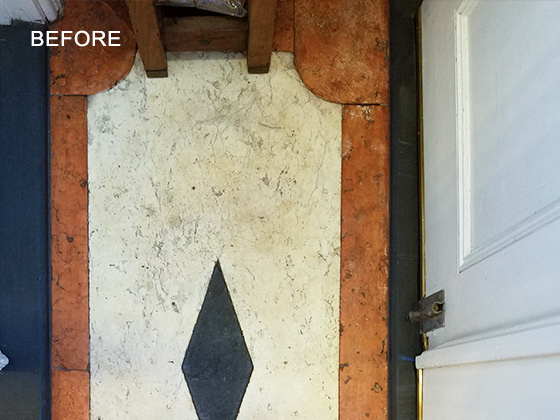 Neither the homeowner, nor the architect, nor the restoration professionals who had serviced the floor in the past knew that the marble was white. 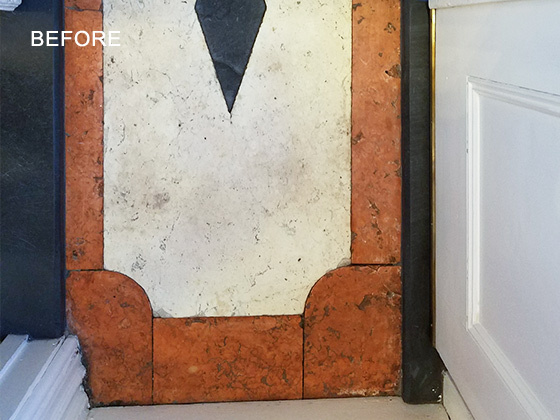 Unfortunately, the homeowner had just finished restoring her home after a flood and had asked a painter to match the wall paint to the dark red border stones. After we finished honing the marble, we applied a product designed to break down any sealers in the marble. This enabled a new deep red dye application to soak into the stone uninhibited. For the dye formula, we used a red base, and then added other colors to achieve a perfect match with the painted walls. Our client was very pleased with the outcome. As you can see in the AFTER image, the floor looks ornate and elegant once again. To learn more about our marble restoration services, visit our Marble & Limestone Services page or watch this video. Are you looking for marble repair and restoration services in Brooklyn or throughout the NYC | NJ | CT area? Contact us online or call us at 212-777-4040 | 718-776-3564 | 516-377-0993 to discuss your needs.